White coats were evident throughout the building as doctors gathered for Physicians’ Day. After convening in the Hall of Flags among displays by the MMA, the MOA, and various specialty societies, attendees met with Governor LePage for over an hour in the cabinet room. It was a fine opportunity for us to make known to the Governor our concerns about major issues affecting public health and the practice of medicine, and it also afforded the Governor an opportunity to explain to us the reasons for his positions on a variety of pending bills. The discussion was thorough, positive, and very cordial. 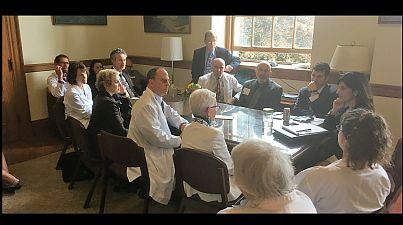 Later in the day groups of doctors met with Speaker of the House Sarah Gideon and with Senate President Michael Thibodeau and assistant Senate minority leader Andre Cushing. The meetings were excellent opportunities to explain matters such as medication assisted treatment and public health nursing to legislative leaders in greater detail than they usually are afforded. The doctors present also had a chance to speak with their individual legislators and to attend sessions of the House and Senate to observe the sometimes baffling process by which bills become law. “Talking point” sheets were available for members to learn the bases for MMA positions on three bills of particular importance before meeting with legislators.